The Bobbilicious Files: The Weather is Making Me Crazy! 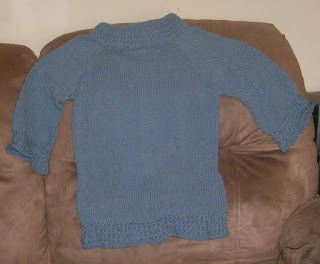 that match a sweater that I made...um, last year I think. This was a fun pattern to knit. I should have done them both at once, like I do sleeves, but I didn't even think about it until the first one was about half done. The picture doesn't show the great stitch pattern - it's like a combination rib and moss stitch with cables. Very pretty! I've been working on a top from the vintage pattern haul in October. It's almost done, I think. The difference in fit and styling has me a bit confused. I know that tops were shorter because waists on pants/skirts were higher, but I'm nervous that it's too short. And I may have goofed on the sleeves, but I'm not sure. I'll keep messing with it for a few days...maybe it needs blocked again. 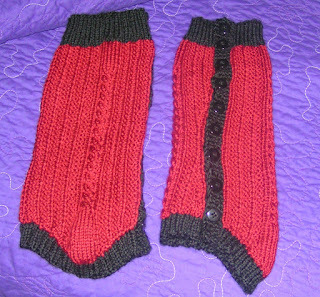 I've knit a couple pairs of socks, too, because my feet have been cold. Sometimes I need to wear two pair to actually feel warm enough. Lately I've been working on keeping our computer running. It's quite old - nine years, I think, and until recently has been great. Lately, though, it's slowing down a lot. I know we need a new one, but honestly I don't want to deal with the whole stress of transferring everything over. I mean, I don't want to transfer my bookmarks from one browser to another! I'd much rather spend my time doing fun stuff...mostly, of course, because I'm computer-stupid and don't often know what I'm doing. I really should take a class. That's all for today. I need to go take more sinus medicine - another weather-related problem - and calm this headache. See you soon!